Sherbet Box is the perfect subscription box for lovers of stationery and everything arts and crafts. 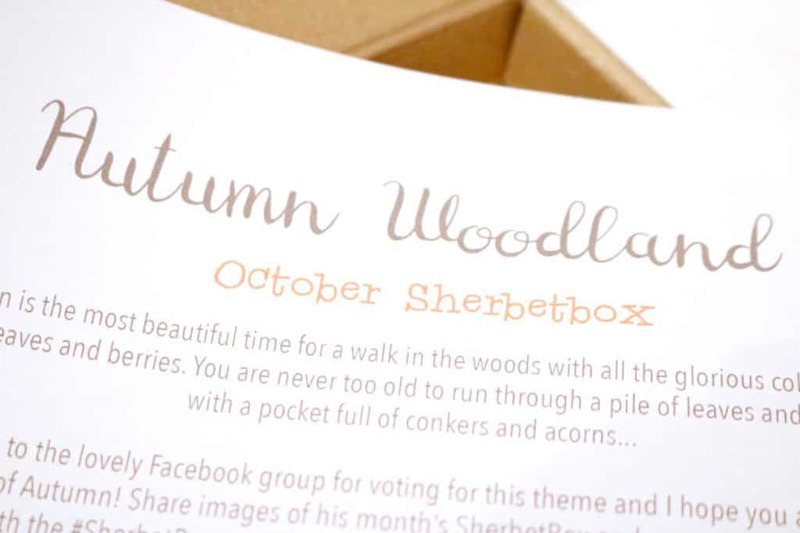 Every month you’ll get a different themed box to encourage your creativity – October’s box was themed on Autumn, and was all things Autumn Woodland! 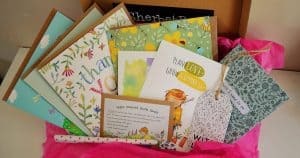 In the October box, I received lots of lovely autumnal goodies – the whole box ties into one around the theme well, and you can tell a lot of thought goes into the creation of the boxes. 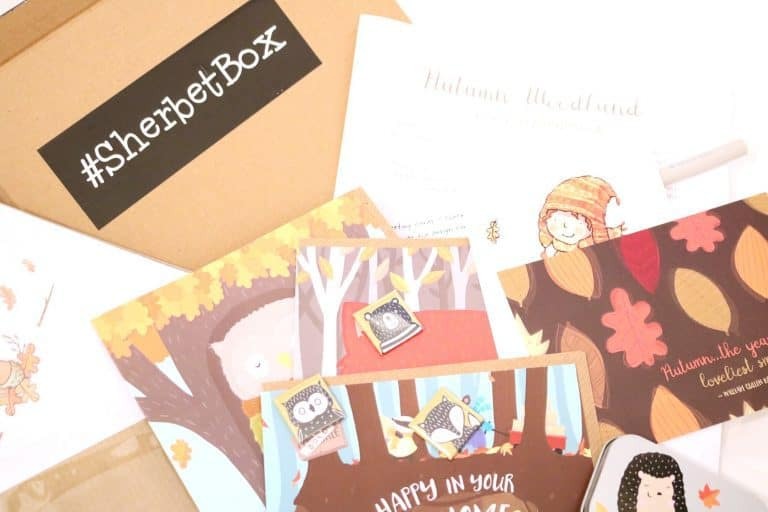 I especially love the autumnal colour palette throughout the box– I do love soft orange, green and brown tones to remind me of piles of fallen leaves! 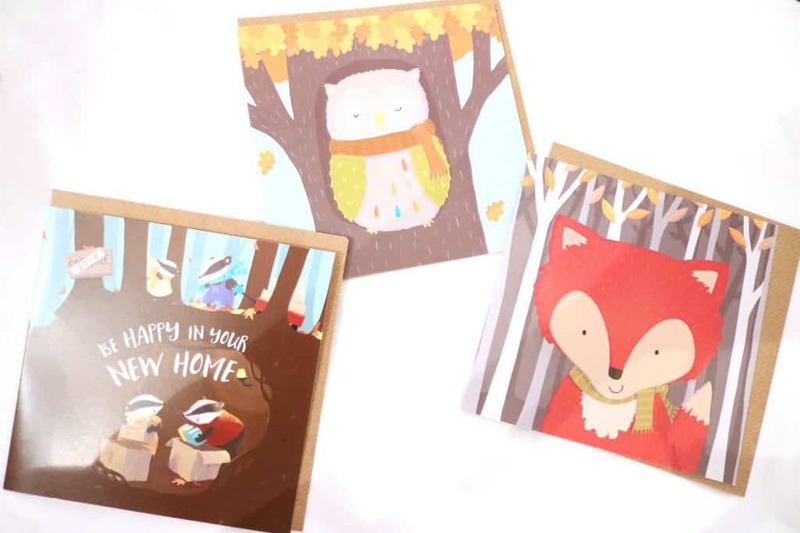 The first thing to catch my eye out of the box were the three greeting cards. 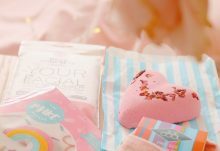 They’re just so cute and pretty, and I can’t wait to be able to use them for friends and family – they’re almost too pretty to actually use! The designs of the cards actually continue round onto the back of the card, which makes a nice change to just a blank white back of cards. 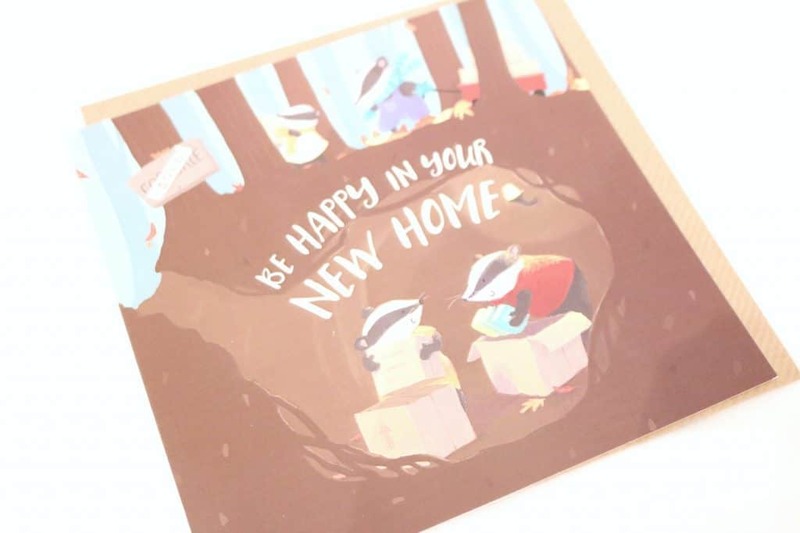 One of my friends has actually just moved out – she’ll LOVE the badger card when I visit her new home! The next items to catch my eye in the box were definitely the two postcards – one is a simple pattern of leaves with an autumn quote. 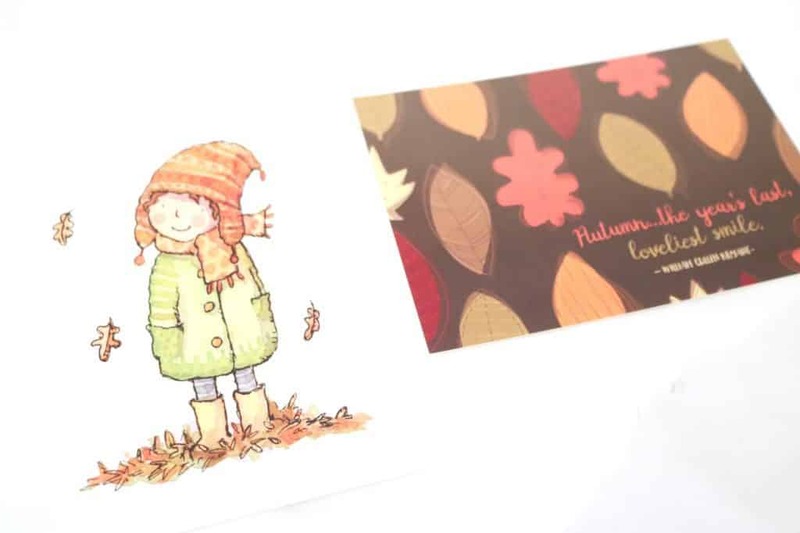 The other is a print of a watercolour painting of a girl all wrapped up in winter clothing standing in a pile of autumn leaves – it is SO sweet! I’m definitely not sending it in the post to someone – I’m keeping it to decorate my house every autumn! 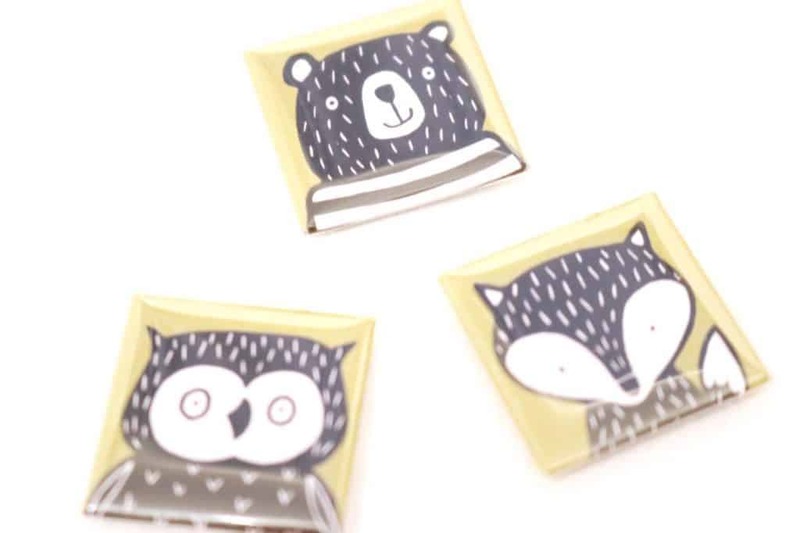 Also in Sherbet Box were three little woodland creature magnets – these are super cute and I just wish I could think of somewhere to use them – I don’t have anything magnetic! 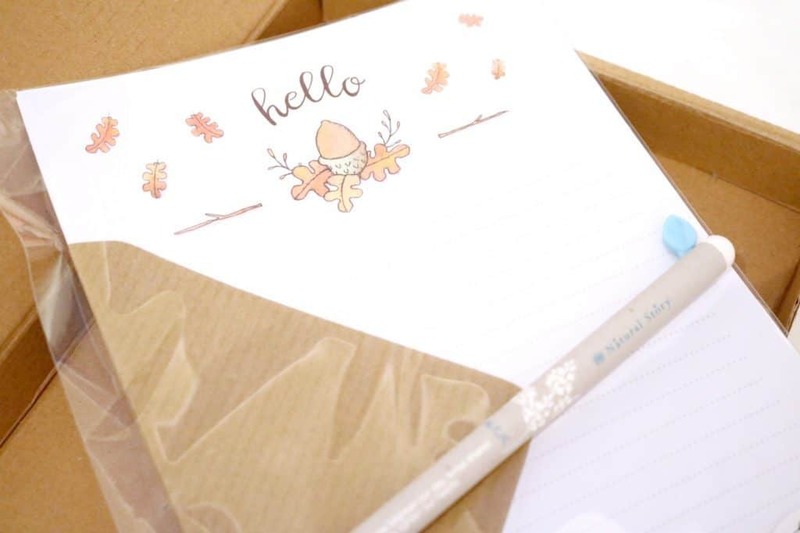 For the self confessed stationery hoarders among us, there was also some autumnal letter writing paper, brown envelopes and a pen with a leaf design! 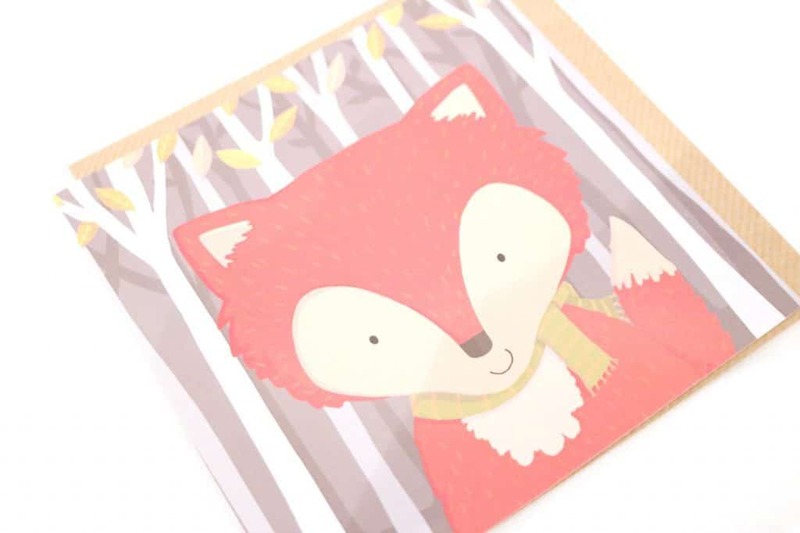 I don’t really write letters to anyone, but I definitely think it’s handy to have some letter writing paper around. Maybe this will encourage me to pick up a pen and write a good old fashioned letter every now and then, rather than relying on texts and emails! Last (but definitely not least!) 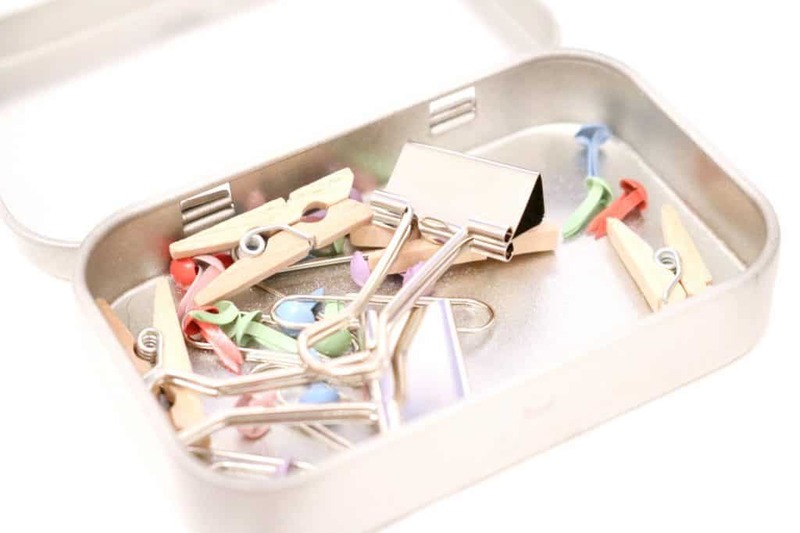 there was a little tin full of all those odd bits and bobs you always need – pins, mini pegs, bulldog clips etc! At first, I just popped this in my drawer knowing I’ll need them at some point and oh how right I was. Whilst doing a deep de-clutter of my room, I realised I had a lot of things I wanted to display in my room, but I actually only have one nail in the wall above my desk, and so I only ever hang one photo at a time. So… I got creative! 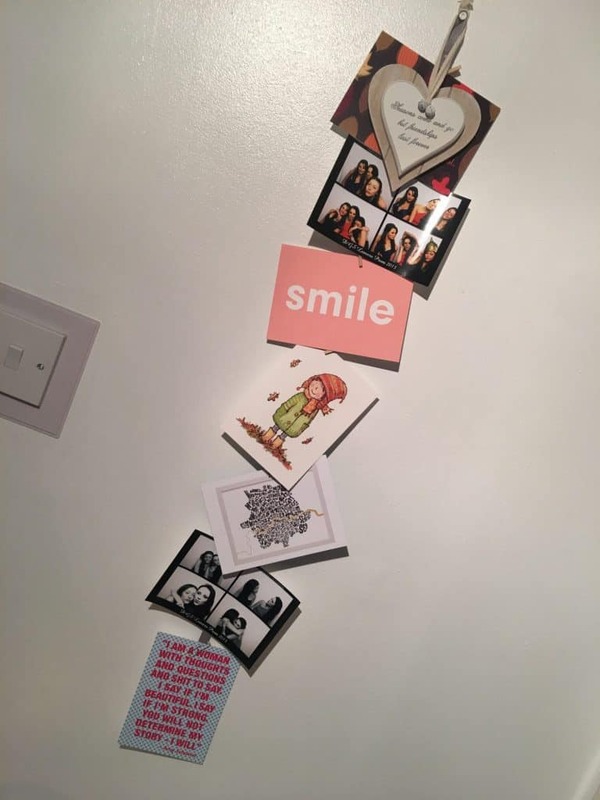 I looped the top of a length of ribbon, secured with a pin, and then used the mini pegs and bulldog clips to secure different prints and photos, which created a really cute wall hanging! I’m rather proud of this one – sometimes it is the most simple of creations that are the most useful! I’ve popped a photo below of the finished product – please excuse the awful lighting, though! 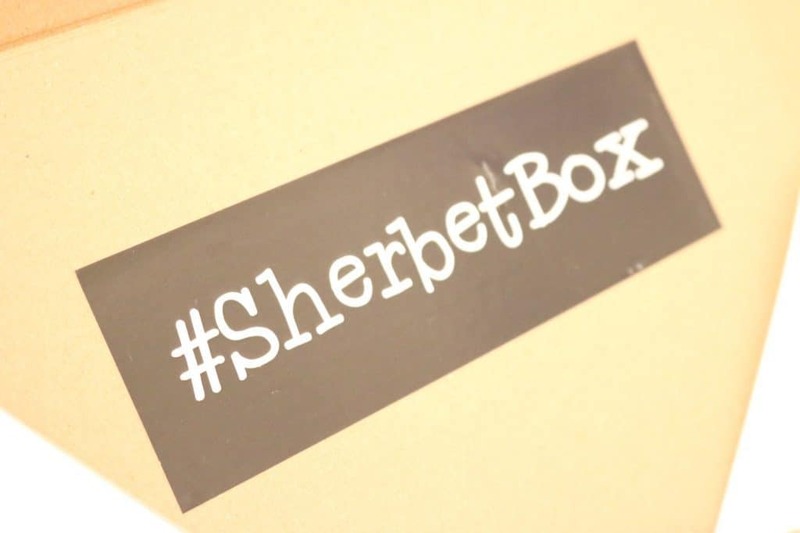 One of the great things about Sherbet Box is the community surrounding it – there is a facebook group for subscribers, where you get updates on when to expect the box, sneak peaks, tips and tricks and much more! A lot of members share their thoughts on the box and even pictures of how they used the items in the box to get their creative juices flowing. It creates a sense of community, and is lovely to see what other like minded individuals are up to! 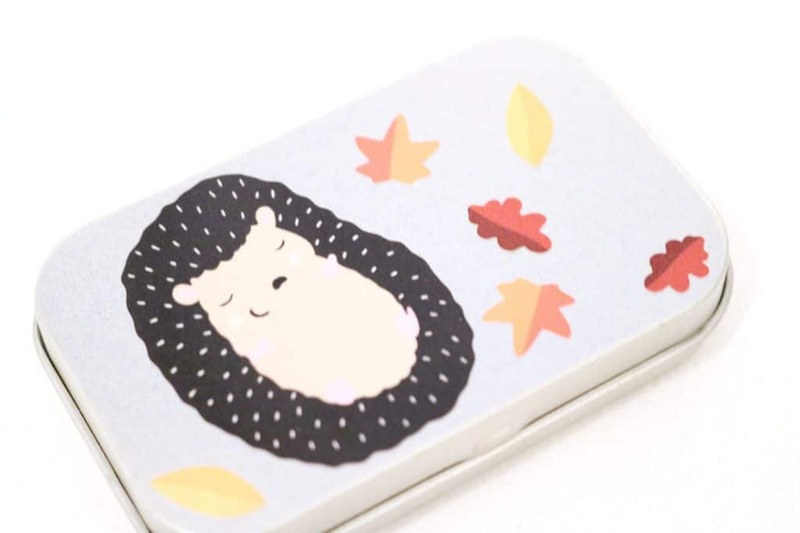 A great little box for stationery lovers and craft addicts! Fun, thoughtful and useful.